Relative strength refers to how strong a stock is relative to something else. This could be either how strong it is compared to the overall market or the industry group that it is in. If it is stronger, than then we say that it has relative strength. If it is weaker, than we say that it has relative weakness. To improve your odds of a successful trade, you want only want to trade stocks on the long side that are stronger than the market itself. One way to do this is to compare it to the S&P 500. 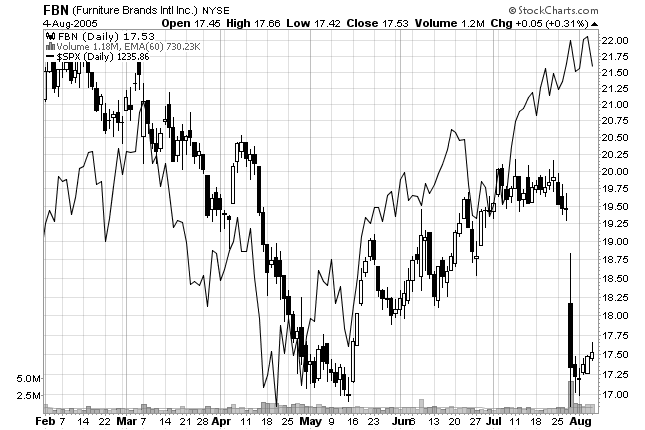 Looking at the chart above we have the stock compared to the S&P 500 (black line). In early May, you can see that the S&P 500 began to rally, as did the stock itself, but the stock was weaker than the S&P 500. This stock had relative weakness. It eventually sold off. You can also compare stocks to the specific industry groups that they are in. On the long side, you want to be trading the strongest stocks that are showing relative strength compared their industry group. On the short side, you want to be selling stocks that are showing relative weakness compared their industry group. You can also compare different industry groups to each other! For example, on the long side, you can see on a chart which industries are leading the market. Then you can select those stocks in those industries. Ok, by now I think you get the point. You just want to find out how strong or weak a stock is BEFORE you trade it! But wait, is there an easy way to find all of this out? Yes! Wait until the stock market sells off hard for a few days. Now go through the stocks on your watch list. Which ones are up on the day that the market has sold off? Those stocks have relative strength and those are the ones that you should be trading. Why? Because these stocks will be the ones that will move first when the market recovers and will make the most significant gains. Also, look at charts for the various industry groups. Which ones are up on big down days in the market? Those industry groups have relative strength and those are the ones you want to be in. This is completely the opposite on the short side. On big up days in the market look for the industry groups and stocks that are down for the day. These are weakest and the ones that you should be focused on for shorting. Do not underestimate the simplicity of this technique! If you mainly trade on the long side of the market, use the down days in the market to go through your watch list. Find the stocks that are up for the day, showing relative strength. Then wait for the right time to enter the stock. I promise you that doing this one little thing will greatly improve your trading!